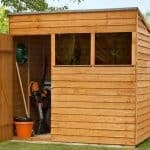 Resin Storage Sheds - Who Has The Best Resin Storage Sheds? 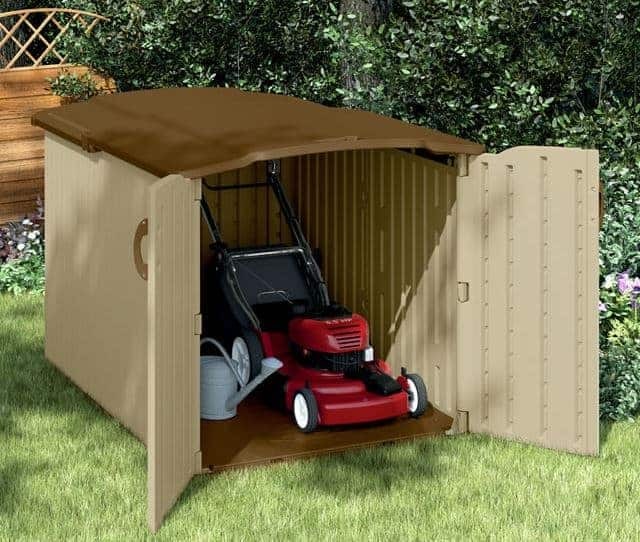 Resin storage sheds are very durable and versatile additions to any garden. Plastic sheds as a whole are becoming increasingly popular, as they typically offer great value for money as well as being very low maintenance. Resin storage sheds, however, can be even tougher than PVC sheds, and advancing technology means that they are now more resistant to cracking and yellowing than models of yesteryear. 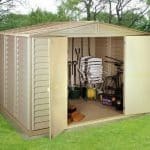 With an increasing market for them, WhatShed have created this useful guide to the ten best resin storage sheds that can be bought online in the UK today. There were a lot of factors to consider when deciding upon the final position of each shed, but of course the cost and overall value for money were a primary consideration. We also looked at the storage space provided, although it should be noted that for the purposes of this league table we’ve only considered as storage sheds those that have less than forty square feet of storage space rather than larger garden sheds. The overall looks were also taken into account, as were any value adding features. 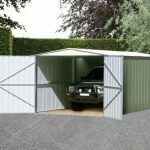 Resin storage sheds can look superficially similar, in that they are often cream or beige coloured with dark detailing. As this league table shows, however, there can be large differences between them. 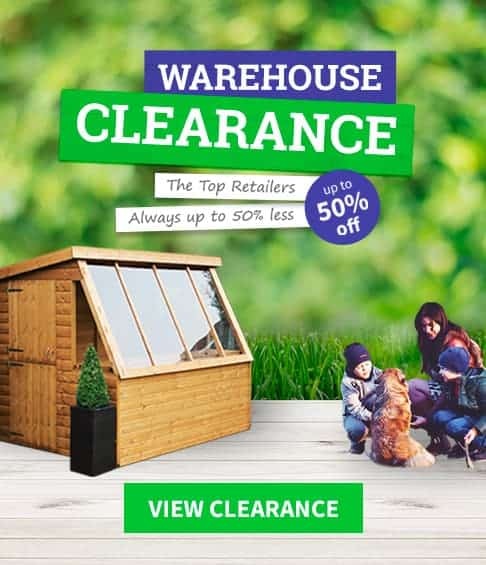 Congratulations, then, to the Suncast Tremont Five shed which thanks to its generous dimensions, low price, long warranty, and double skylights takes top position in our run down of the UK’s best resin storage sheds that can be bought online. From storage sheds in plastic or timber to metal garages, WhatShed bring you independent reviews that can help you make a wise purchasing decision every time. This is the largest of the resin storage sheds to make it into our top ten league table, with a base area of 2.43 x 1.24m and an apex roof that rises to a height of 2.62m. 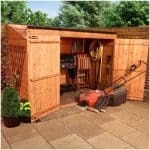 That means that whilst it’s still compact enough to be considered as a storage shed, and doesn’t take up too much room in the garden, there’s still enough room to move around in and you can store a large selection of garden tools and equipment. At under seven hundred pounds we feel it represents very good value for money, and with a host of value adding features that we don’t often see on other resin sheds this earns its place at the very top of our league table. One of those features is an integrated set of corner shelves, which make it easy to keep the interior tidy and organised. We also liked the tiny set of windows at the top of the wide opening double doors, as they allow light in without allowing passers by to see what’s kept inside. This was also helped by the inclusion of two skylights in the roof, meaning that the interior is flooded with light on a sunny day. 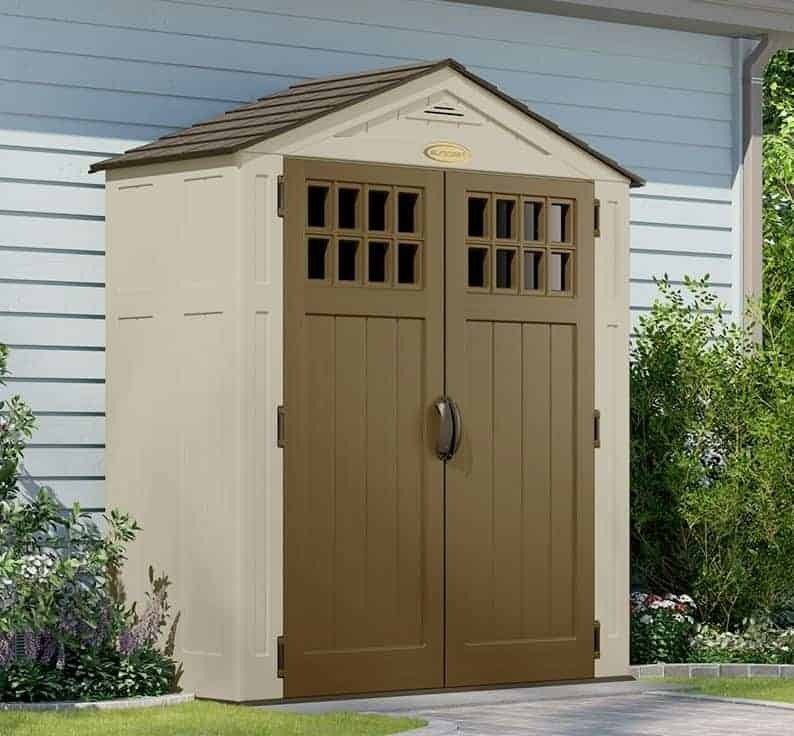 It’s a very welcome feature that we haven’t seen on any other resin storage sheds that we’ve reviewed. These six foot by six foot resin storage sheds caught our eye for all the right reasons, and proved once and for all that resin sheds can be attractive as well as functional and durable. Whilst it employs a mainly off-white colour scheme, with contrasting dark grey being used for the roof and the double doors, the resin itself has been given a wood grain effect. Whilst this doesn’t of course mean that it actually looks like timber we did find it pleasing on the eye, and is a touch of class that we found replicated across the shed as a whole. Unlike many of the other resin storage sheds we review, this has a window in a side panel. Being made of styrene there’s no need to worry about it shattering, and it’s as tough as the shed itself which comes with a ten year manufacturer’s guarantee. This means that the interior is light, particularly as we were pleased to find that extra light also comes in from a translucent panel in the roof, but it’s also pleasantly airy as well thanks to an integrated vent placed in the gable beneath the shallow apex roof. 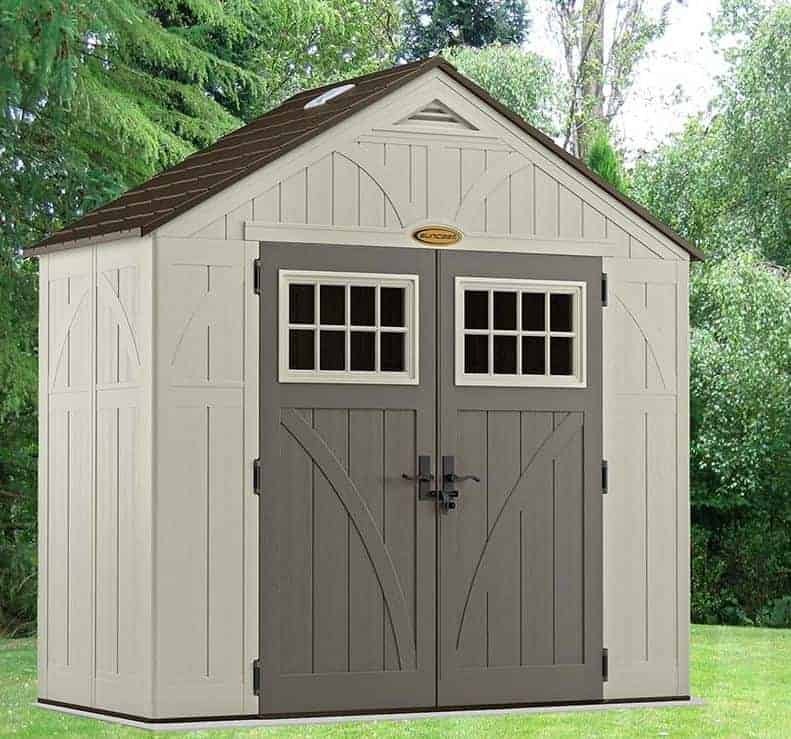 For a shed of this size that has a plentiful supply of natural light it also has a great value price tag, which helps it claim the runner up spot in our list. 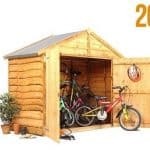 Third place in our WhatShed league table is once more taken by a shed that has a look distinct from all the other resin storage sheds we’ve reviewed. For that reason, we feel it would fit in well with people who have a contemporary and original looking garden, particularly one with lots of white plastic components such as fascias and soffits. 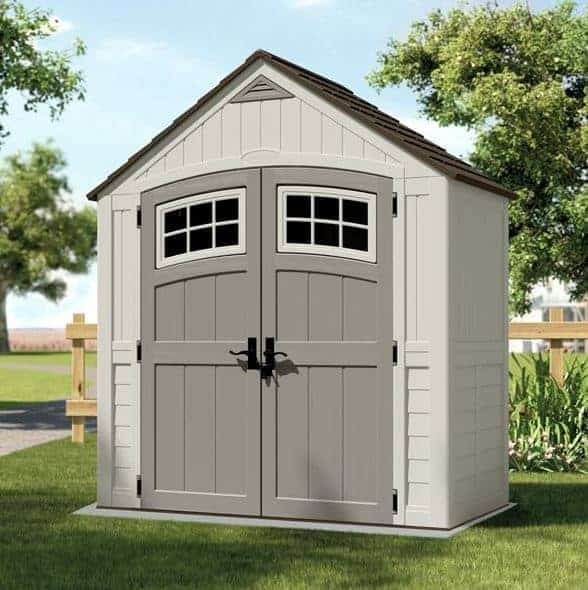 Like most of the larger storage sheds in this league table it has double doors, but in fact these double doors were the first thing that grabbed our attention. That’s because they feature a curved rather than straight top section, and they also contain two windows that are also curved in the same manner. It’s a stylistic flourish that sets it apart from its competitors and which we feel looks very impressive. Another point of difference was the shingle effect pattern placed upon the apex roof. It’s another unique touch, but of course the roof still carries out its essential task of carrying rainwater away and keeping the interior and its contents dry. Resin storage sheds are naturally very tough and weather proof, of course, as they can’t rot or rust and aren’t prone to insect attacks. We were pleased to see that this was again reflected in a 10 year manufacturer’s guarantee which gives added value to an already reasonable price. Whilst BillyOh are renowned primarily for their high quality and attractively designed timber sheds, it was good to see that they also offered resin storage sheds that shared the same ideals. It has an off white and brown colour scheme that the manufacturer refers to as sand and chocolate, and because UV resistant resin has been used for the cladding it won’t fade or yellow over time as some sheds have done in the past. That means it should stay looking just as good in a decades time as it does on the day it was installed, a fact that’s borne out by the inclusion of a 10 year guarantee. This is another of the resin storage sheds which features a row of tiny windows that run across the width of the double doors. It’s a feature that we always like to see, as natural light can make it much easier to store and retrieve items and yet it doesn’t compromise the security that’s all important for garden storage facilities. With base measurements of 2.03 x 1.68m this is another of the more accommodating sheds in our league table, size wise, and on this occasion it also has a price tag to match. The most expensive shed that earns a place in our top ten, it’s only this that stops it from achieving an even higher position. 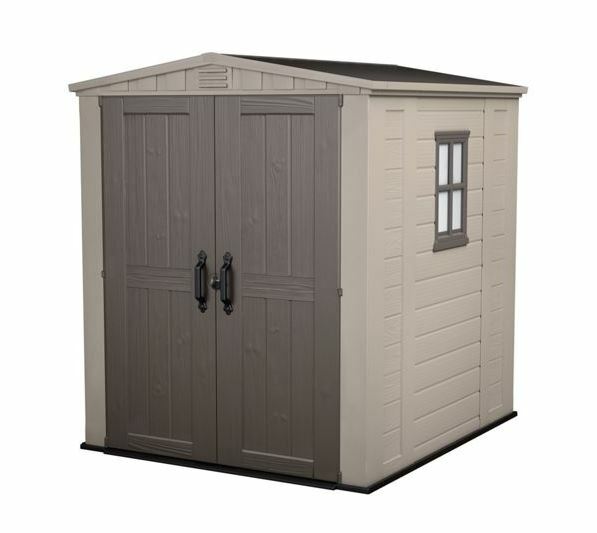 This is the only entrant in our top ten resin storage sheds that has a pent rather than apex style roof; this gives it a unique look amongst its competitors, and it also has what many people would consider the advantage of being more compact and less obtrusive than an apex shed. The roof itself, which is coloured dark brown in contrast with the beige resin cladding underneath it, has a peak height of 2.01, and its pitch ensures that rainwater or snow is quickly channeled away rather than being allowed to settle. Another differentiating feature from the other resin storage sheds is that this one features a single hinged door at the front and a small square window with styrene glazing alongside it. Whilst this means that you may not to carefully manoeuvre some larger or wider objects in and out, we liked the way that once inside you can look out and see what’s happening in front of the shed. The overall dimensions are 1.84 x 1.11m, and this offers a very useful amount of storage space for what is a very low price tag of less than two hundred and fifty pounds. This is the best value resin shed we’ve reviewed, and that earns it a place inside the top half of our league table. This could never be ranked amongst the most attractive of the resin storage sheds that we’ve reviewed, and this has been taken into consideration when determining its final positioning, but it is very accommodating and very secure at the same time. That’s because it features no windows at all, making it impossible for passers by to see if anything of value is stored inside or not. The easy grip handles on the double doors can also be easily fitted with a padlock, and if this is done then this will be transformed into a very secure garden lock up. The base width is 1.42m and the base depth is 1.24m, and there’s also a ridge height of 2.03m. 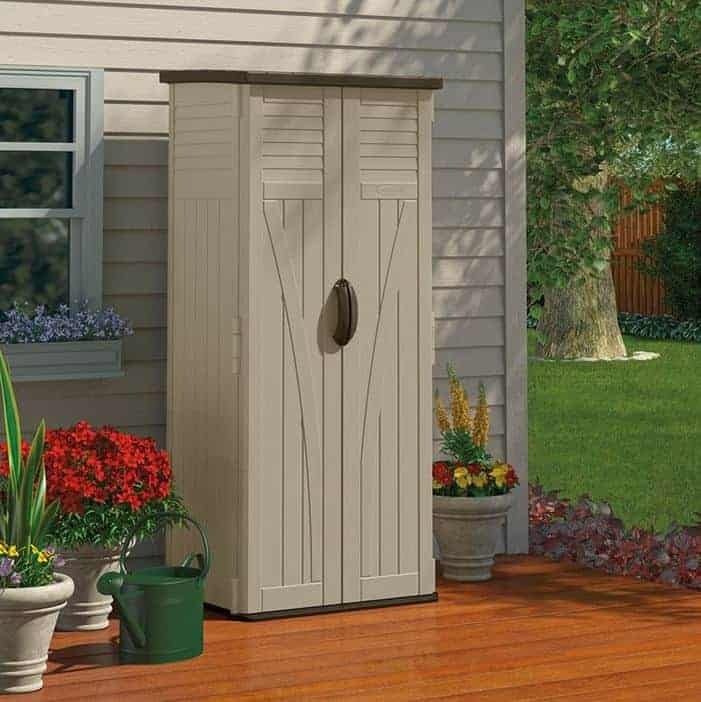 This gives it an overall storage capacity of 98 cubic feet and we feel it would be ideal for storing taller items that are used in a garden such as hoes, rakes and strimmers. The double doors take up the whole of the front of the shed, so storage and retrieval is very easy, and we were pleased to find that the interior has shelving supports included as standard for any suitable shelf to be placed on. This is something we don’t often see with resin storage sheds, but it can save the customer both time and money. 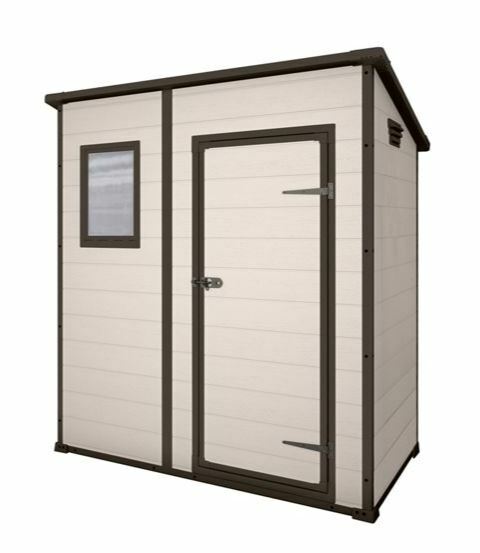 This model from the high quality Suncast range of resin storage sheds is much shallower than most others, with its width of 2.03m being accompanied by a depth of just 0.86. This in itself, however, makes it eminently suitable for those who have shallow lawns or whose garden space is at a premium. The other thing that struck us upon first seeing this shed was how the frontage was dominated by the brown coloured double doors, and with a width of 1.42m and height of 1.81m they’re amongst the largest that we’ve seen. This makes it very easy to get objects in and out, and of course we welcomed the added bonus of not having to stoop down when walking inside. Once more there’s a tiny row of windows along the upper portion of the doors, and we were pleased to see the vents in the gable. Resin storage sheds can be particularly susceptible to a build up of condensation on either hot or cold days, so these vents should help to keep both you and the stored items in perfect condition. With blow moulded double walls, this is also one of the toughest resin sheds that we’ve seen, and with a 10 year warranty included as well this is a shed that you can install and then not have to worry about again. 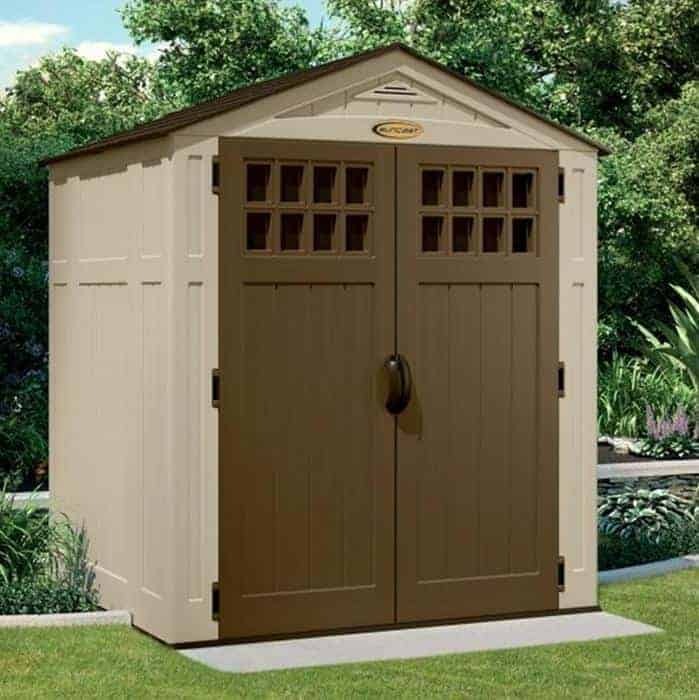 One key difference that resin storage sheds have to many other garden buildings, besides the obvious difference and advantage of their substrate, is that they are designed primarily as a weather proof space store goods in rather than as a place to spend time in. 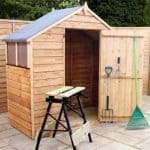 If this is your primary concern, rather than wanting a relaxing place in the garden as well, then this could be the perfect shed for you. Upon first site we were struck by how short it is, as its peak height of just 1.16m makes it the lowest profiled shed to make it into our league table. The accompanying base dimensions are 1.35m x 0.83m. This then is the most compact of all the resin storage sheds we’ve reviewed but this means that it’s ideal for smaller, or rather crowded, gardens and it could even be sited on a patio or balcony. We can also imagine this being used as a cost effective storage solution at a caravan or camping site. As resin is a fire retardant material, as well as being very tough and durable of course, it fits in with the fire regulations that such sites use, and as it’s very easy to assemble and disassemble it’s also very portable. It’s this versatility, and the low asking price attached to it, that earns this resin shed a place inside our top ten. This is another of the low resin storage sheds in our league table of the ten best models available to buy online in the UK today, with a roof that stands just 1.32m above ground level. One advantage this brings, however, is that it can easily be hidden away behind a fence or a wall thus creating a more secure storage solution. It also means that whilst you can store more gardening tools and equipment inside than you might at first think, it won’t stand out in your garden and in doing so detract from its surroundings. As it is, this is more then big enough to store a lawn mower or even a bicycle inside, and it has base dimensions of 1.46 x 2.03m. One feature we particularly liked is that the lid can simply slide out, unless it’s locked in place by the additional purchase of a padlock. This makes it very easy to remove and store objects, and also means that you can make use of every inch of storage space available. 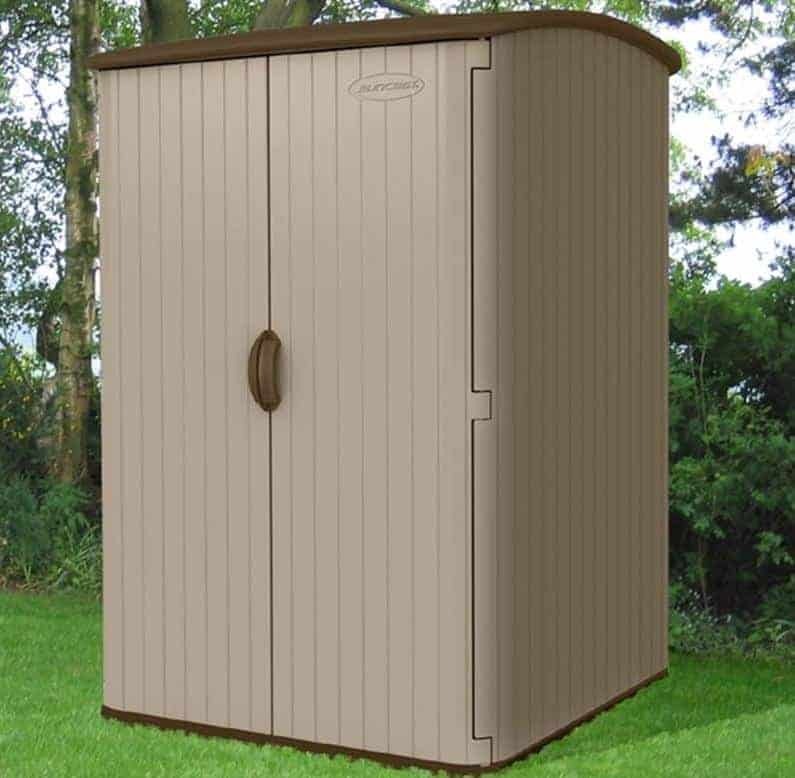 These very compact resin storage sheds could prove particularly useful if you’re a keen gardener without much room to spare, and it’s only an above average price that keeps it inside our final three sheds in the league table. We’ve already seen the benefits that the low profile BillyOh horizontal resin storage sheds can bring, and now we come to the narrowest resin shed that we’ve seen. It has a base width of 0.65m and a base depth of 0.82m, which means of course that it isn’t suitable for storing wide or bulky items, but also means that it can fit into almost any corner and once again is easy to transport and assemble. It has a height of 1.83m, or six foot, however, so it’s suitable for the storage of tall and thin items. The reason that this particular building takes the final position in our league table of the top ten resin storage sheds is that it’s very affordable, especially as it’s made from high quality resin. It comes with the reassurance of a 5 year manufacturer’s warranty, but as it’s a very tough substrate that won’t rot, rust, or fade, we wouldn’t be surprised to find that it far outlasts this warranty period. We were glad to see that the handles were holed as well, making it easy to add a padlock for extra security. 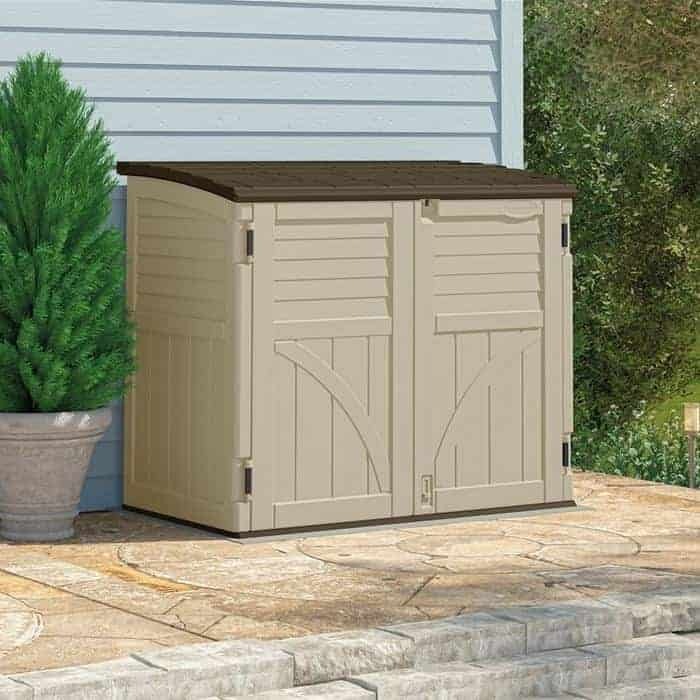 For those looking for a plastic storage shed that costs less than two hundred pounds, this is certainly worthy of a place on their shortlist.